Mammoth Dill is an annual herb which can reach a height of up to 1 metre tall when grown under ideal conditions. The small, yellow flowers help to attract beneficial insects such as ladybirds and hoverflies to the garden. Dill is native to the Mediterranean. This variety is sometimes alternatively called Long Island Dill. Mammoth Dill is one of the most prolific and easy to grow of all Dill varieties. Both the leaves and the seeds can be used. The leaves retain their flavour well when dried. 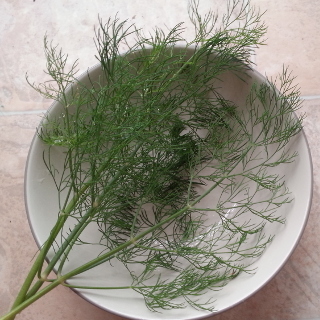 Dill prefers growing in a sunny location, although it'll grow fine in partial shade too. Dill is good for inter-planting between cabbages, broccoli and other brassicas as a companion plant. Sow a small number of seeds regularly to ensure a continuing supply of fresh, new leaves. In subtropical regions for best results sow Dill seeds during the months of March, April, July or August. The tropics generally tend to be too hot and humid to grow Dill successfully, but for anyone willing to give it a shot the best month to sow would be June. In temperate areas sow in September or October. In colder regions of Australia sow in October or November. Sow Dill seed 6mm deep spacing plants about 15cm apart. If direct sowing, plant several seeds in each hole and thin to the healthiest seedlings. Most Dill seedlings will take between 14 and 21 days to germinates, although some of the seeds may germinate faster or slower than this. Harvest Dill as required, the first harvest can be made between 7 to 9 weeks after sowing once the plant is big enough.